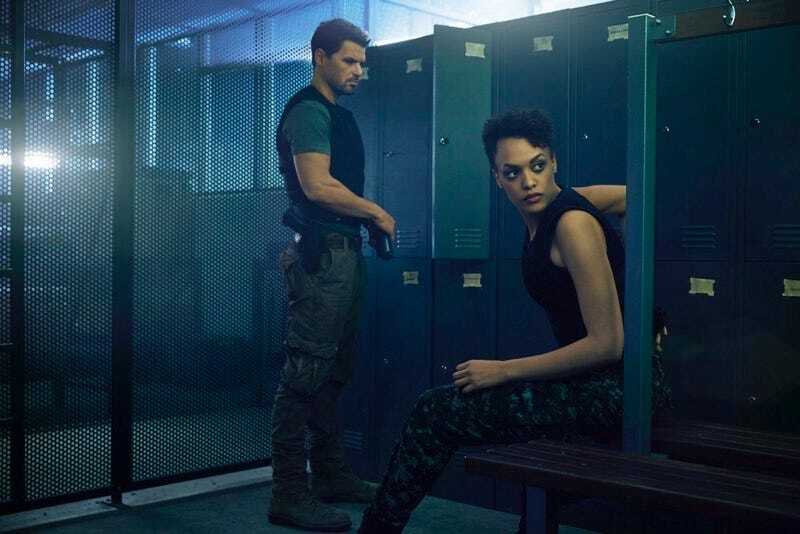 Hunters is Syfy’s new show about elite agents who chase down mysterious sleeper cells that have infiltrated everyday American communities—with a twist: the terrorists are aliens. The show debuts tonight, and we’ve seen the first two episodes. Here’s our mostly spoiler-free review. Hunters may not have a particularly recognizable cast—aside from Julian McMahon (Childhood’s End) and that one guy from Wolf Creek (Nathan Phillips). But it has the behind-the-scenes heft of veteran producer Gale Anne Hurd (The Walking Dead, The Terminator) and producer-showrunner Natalie Chaidez (12 Monkeys, Terminator: The Sarah Connor Chronicles). Plus it’s based on a series of novels by Whitley Strieber. The show may have that “set in D.C., filmed in Australia” dissonance, but that actually adds to its dystopian vibe. And while the show’s attempts to comment on the War on Terror may seem clunkily obvious at first glance, Hunters has enough fresh components to bring some nuance to its particular brand of terrorism metaphor. To that end, the most important character so far is Exo-Terrorism Unit agent Allison Regan, played by a very good Britne Oldford. Regan is smart and tough, but she sometimes acts impulsively under pressure—early in the first episode, she defies orders and chases down a suspect, a decision that causes the death of another operative. But that’s not the only reason why her teammates look upon her with caution. Regan is, openly, a Hunter, a member of the alien race that the ETU is sworn to take down. And her erratic behavior is directly related to the strange urges she feels. Her alien ways are highly prized by her supervisor at the bureau, to the point where he won’t let her take medication to suppress her more vicious desires. Needless to say, the conflicts Regan has with her co-workers pale in comparison to her internal struggles. Less compelling is the tale of Flynn Carroll (Phillips), who has a checkered past as a regular FBI agent but is nonetheless recruited by the ETU. He’s a troubled dude; his wife has gone missing, and seems to have some kind of secret link to the aliens. Plus, Flynn is the guardian of an orphaned teenage girl with spectrum disorder, a subplot which is a bit clumsily handled in the opening episodes, but could prove interesting as the show progresses. In the year 2016, with terrorism a constant fear, it’d be easy for Hunters to slather on its allegorical elements with a heavy hand. Some parallels are clear and obviously deliberate, as when an ETU supervisor barks, “We don’t negotiate with terrorists!” after the sinister DJ mixes up some life-or-death demands. But the terrorism plot isn’t Hunters’ only focus. Just going by the first two hours, it’s clear the characters are more than capable of generating their own personal dramas, too—much like producer Hurd’s The Walking Dead, in which zombies aren’t always the scariest thing onscreen. The saving-the-world stakes are high, of course. But based on these first two episodes, Hunters is aiming for some subtlety along with its broader themes. As mentioned above, Regan’s story is a fascinating way to look at the conflict, especially considering how enigmatic these aliens are to begin with. How did they arrive on Earth, how long have they been here, and what do they want, exactly? And Regan’s presence adds important depth to the us-vs.-them dichotomy. How did such an outstanding young alien fighter start working for the human enemy? These are questions that Hunters will no doubt investigate as the season progresses, and they’ll hopefully bring complications to a plot that could easily have leaned on nothing but rhetoric and tense standoffs involving exploding aliens. To be honest, we’d probably still tune in if that were the case—but the fact that Hunters is trying to be something more character-focused gives it a lot more potential. Hunters debuts tonight at 10 PM on Syfy.